The Star Hotel was built in 1748 and is known to be one of the oldest coaching inns in Scotland. Before the river South Esk was first bridged in 1795 it was the northern terminus and posting house for coaches arriving from, and proceeding to, the North. 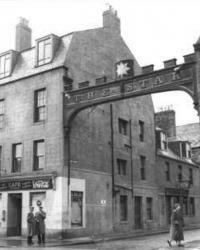 Until the early 1960s our famous ‘Star Arch’provided a welcome sign at the end of New Wynd and ensured no visitors ever missed us! A wonderful painting of that coaching era showing the Star arch is on display at the hotel. In addition to 15 bedrooms we also have two well stocked bars on the ground floor with a pool table and dart boards. We also have a third bar in our function room on the first floor with a stage and lounge area where we can accommodate parties of up to 140 people.